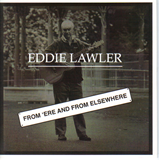 Eddie Lawler's music and writing feature strongly in the lives of people living in Saltaire. Eddie lives a stone's throw away from Victoria Hall where his play, Saltairy Tales has been performed during the past two Saltaire Festivals. His music and poetry combine Yorkshire wit with serious social comment. She’s wise alright, this lady. Hard, however. As she has to be. She’s blushing, deep, all over.